My blog has been pretty quiet since finishing my training and my first trip. Some of it has been because I was out of town (not enjoying sitting at the airport waiting to get on a flight), but most of it has been because I’m unsure what to write about anymore. I obviously want to continue my blog, but winter on the East Coast will stop a lot of my flying. I am also interested in getting a seaplane rating and doing aerobatics, both not ideal for winter weather. Also, trekking out to the airport in cold weather – now that I have to actually walk the 2 miles – is less than a pleasing idea. So it’s tough to get up. Today it was gusting to 31 knots, ouch. I’ve pretty much come to realize I have to at least try to get my instrument rating. Flying was probably the worst thing to take up because if there’s a new challenge or goal, I’ll always want to try to get it. Now, it’s just working up the courage to do it. It’s not a thing to be taken lightly in my book. Not only is it more money and a time commitment, I have to convince those close to me it’s not a waste or a bad idea, specifically my boyfriend. I’ve been dropping the idea more and more, like originally doing a PPL, he’s not a fan. Now, for those who have read a good deal of my blog – you know that’s not going to stop me and I’m quite the stubborn person. It’s just planning it and doing it the right way. And then bringing it up to my mom, I think she’s realized by now I’m too stubborn to listen to her, that once I set my mind to something I can’t be stopped, but she still won’t be happy. Then I have to build up 50 hours of cross country time – in winter. Most likely it’ll be slow going, especially since mid-January to mid-March I’ll be working with the NHL and won’t have any time to fly most likely, but then will have money to fly! 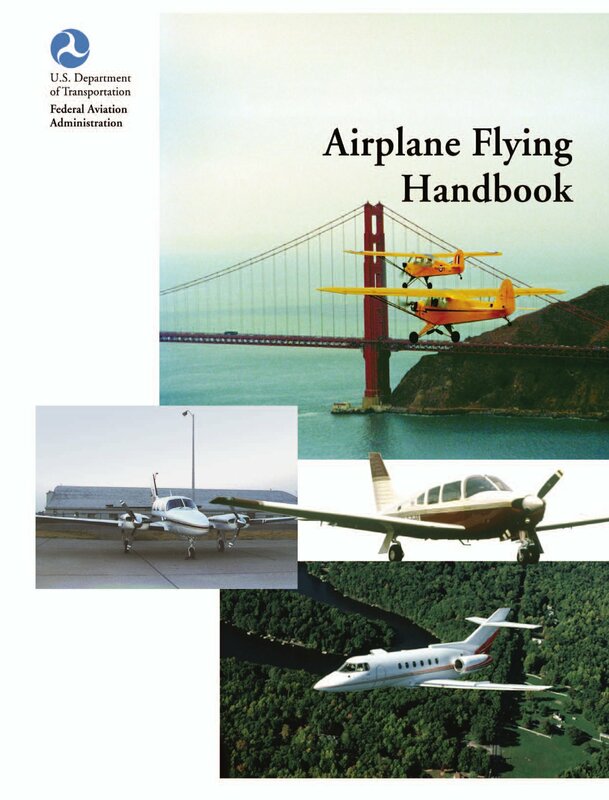 But I’ve already started slowly going through the American Flyers Instrument Rating book, they send me the PDF for free, which was great and it’s much easier for me to read than the FAA Instrument Flying Handbook, which I’ll tackle later. My master plan is to be able to pass the written and have almost all 50 XC hours before beginning formal training – but with Jake also being a CFII I hope during some XCs he’ll come along and “teach” or probably rather be a safety pilot. Also, the waiting period will help because the 152 is in the process of becoming IFR rated. But it would be kind of fun to fly the G1000! We’ll see what happens, I’ll keep you updated! And hopefully, I plan to have other things in the works shortly! 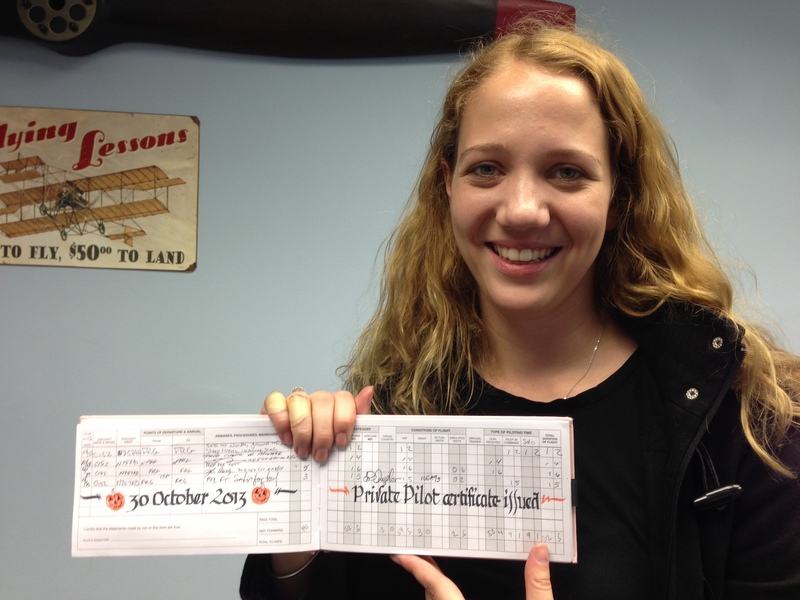 There are so many student private pilot books out there to help you through your training. There’s no way I even tackled 1/16th of them all. I was also trying to save money, obviously. I wanted to review the books I’ve used during my training for others though. Airplane Flying Handbook: People criticize this book as dry. I didn’t think it was that dry, it just was a no nonsense way of explaining the theories behind flying. I liked it a lot. I did end up reading about the maneuvers a lot before ever actually doing them, which it didn’t always stick because of that, but sometimes I’d go back and reference it if I was having difficulty. It helped me a lot with my slips. And now it has color illustrations which is nice. My DPE LOVES this book. Bonus: free online! 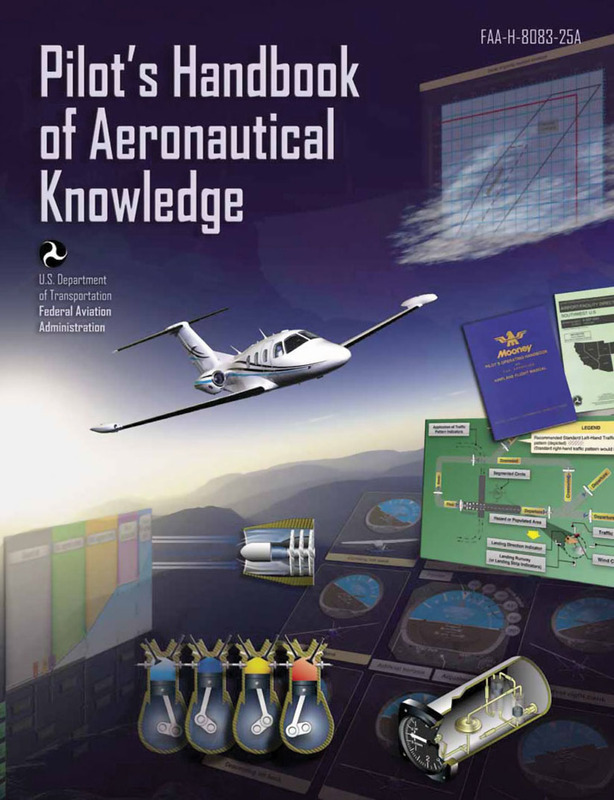 Pilot’s Handbook of Aeronautical Knowledge: Another FAA book, this one is more complicated than the AFH and I had trouble working through some of the chapters. But for the theoretical knowledge of aerodynamics I’d suggest reading this book. Though I had trouble working through the dryness of it, I was able to understand the principles after reading a chapter. 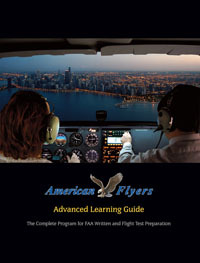 American Flyers Private Pilot Learning Guide and Textbook: This book is amazing. And I got it for free! The illustrations are helpful (especially for the AD stuff) and just explains everything in a very concise, clear way that I enjoy. It is also split up into Written and Flight sections. This book was perfect for when I was taking practice exams. I’d go to the section in the book and review the information so I’d understand it instead of just memorizing the question. 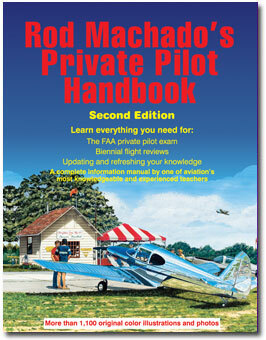 Rod Machado’s Private Pilot Handbook: Honestly, I bought this book because so many people seem to worship this man’s teaching. I have to say afterwards, I’m not one of those people. It is by far the LONGEST book I’ve bought because he just goes into stories about past students or finding another way of explaining a theory in a way he thinks you’ll get it. I didn’t always get the antidote, and frankly, it confused me more than helped me. I’d prefer to just understand the way it actually works with a plane than fitting it to how it works in a car or something. Anyone want to buy this book from me? 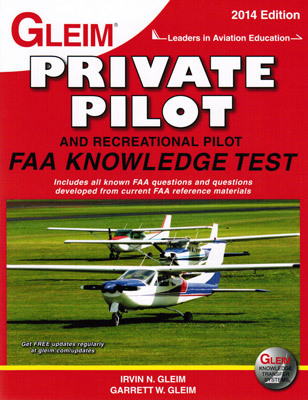 Gleim’s Private Pilot Written Exam Guide: I thought this book was great to study for the written. It outlined every section in a concise way (I’m seeing a theme here.) Each section being broken done clearly and within a few pages was great for my learning and memorization of the harder items. And all the test questions were in this book, which I wish I realized they were the exact questions. It was also helpful looking up after the test because it has all the codes in the back and I could find the question and know why I got it wrong. I looked them up right after I got home, so I found the questions easy. 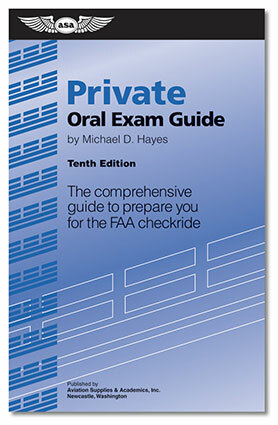 ASA’s Private Oral Exam Guide: I wasn’t a huge fan of this book at first. And still not a huge fan, but it does do its job. I just wish the answered were laid out better and not so technical but the way you’d actually answer the question in the Oral Exam setting. But maybe I’m just picky like that. Ever since earning my Private Pilot’s Certificate (and even when people learned I scheduled my check ride) the question I get from every one is, “what’s next?” I dread getting this question because I really don’t know. I still don’t know and I kind of hate it. This past year I’ve been having that switch from the “I don’t care, I’ll do what I want twentysomething” to a “responsible, future thinking adult” which has made me realize I don’t think the theatre community is for me anymore. I heard some (to me) horrific stories from older actors about what they had to do to make ends meet. Not even having everything secure when having children. I realized to me, that’s not worth it. Theatre used to be my life, but I’m not too happy doing it anymore. But what do I want to do with my life? I’m not sure. Part of me knows I’d love to be in aviation. I’m just unsure of where I fit into it or really how to change careers. I know one thing for sure, I do not want to be an airline pilot. That’s a hard no, and not changing. I’ve seen the struggles and frustrations from Jake’s career and now it’s even harder with the ATP requirement. And it’s not that you couldn’t pay me enough to go through that, it’s that they definitely won’t pay me enough. Or at least for a very long time. Other options have been brainstormed by me and Jake. Air Traffic Controller was his suggestion. I think I could enjoy that, the problem though they haven’t hired in a while and their future doesn’t look the best right now in the US. I’d have to start studying for the FAA’s pre-employment test now though because he knows people who went to college for four years to take that test. Another job I’ve come across is Airline Dispatcher. But as some of you know, I’m not a huge fan of math. I don’t know too much about the ins and outs of a dispatcher, but maybe something worth looking into. There’s also the dream of working for a company like AOPA or EAA, but sadly, a career in theatre doesn’t transfer too well into those positions. Lastly, the job that’s been occupying my mind a lot if a CFI. Argh, and it’s not a too practical job. A lot are time builders so it’s not a well paying job, would I even get healthcare or then worrying about my retirement fund as well. It doesn’t seem like a practical adult job and has a bunch of the frustrations I was facing working in theatre. It’d also be a lot more training. I’d no doubt enjoy that training though, maybe not the cost of it. Then would teaching be for me? I’ve never taught anything, well, an occasional little girl dance steps, but that’s it. Maybe I’ll just work towards building 50 hours of cross-country time required for my instrument rating and see where that takes me. There’s a lot to consider, and eventually I’m just going to have to take a leap no matter what the decision. Jake finished editing the video from our first trip together! You can watch it: Hudson River VFR CorridorIt’s a little over 8:00 minutes long – I know long, but it’s from 2 hours of footage. I think he did a pretty good job of editing it. Let me know what you think! I hope we can do another trip soon and have another fun video. Any suggestions of fun places to go in the Northeast? 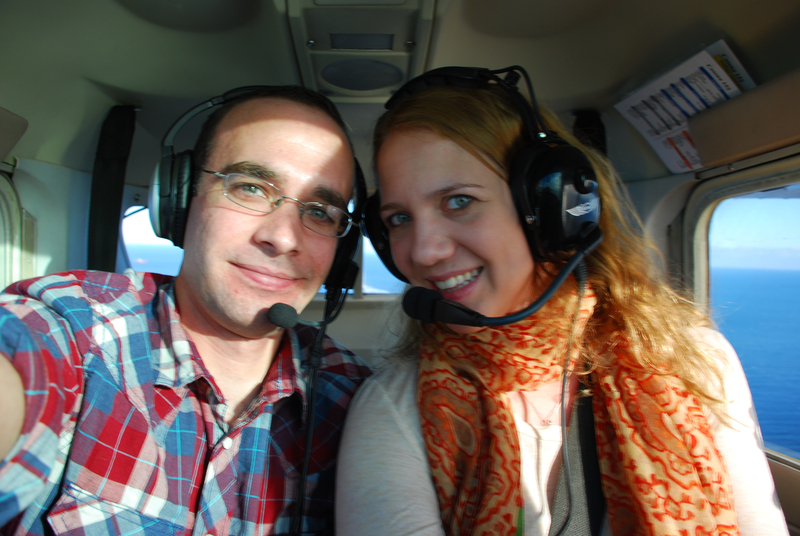 Yesterday I got to take my wonderful boyfriend on our first flight together. Background: We’ve been dating over two years and he’s always been an airline pilot. I’ve been DYING for the day he’d take me up in a small plane (all the other pilot girlfriend’s I know have a picture of them both in a headset in a small plane, it’s cute) and because of a variety of things it never happened. He did go up in the back of a 172 once on my second lesson, and I took one of his flights home for Christmas our first year. That’s the extent of our flying together. Therefore, I couldn’t wait for tomorrow. 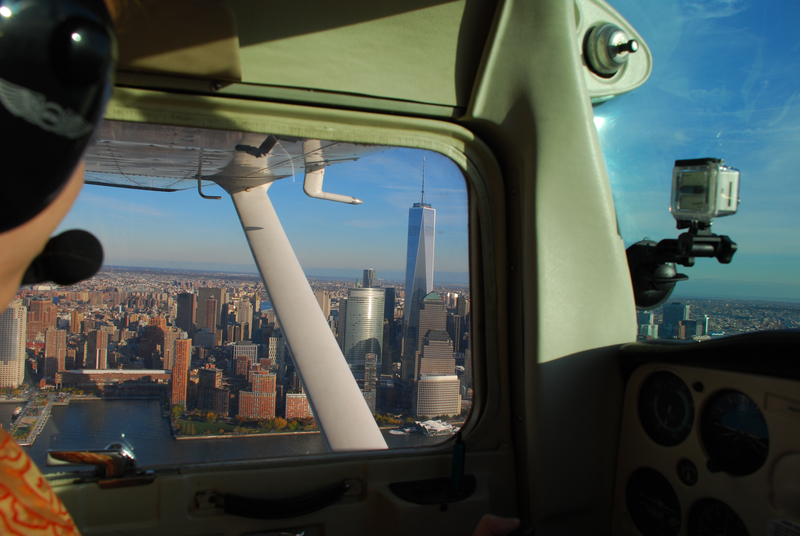 We were doing the NYC VFR Corridor. 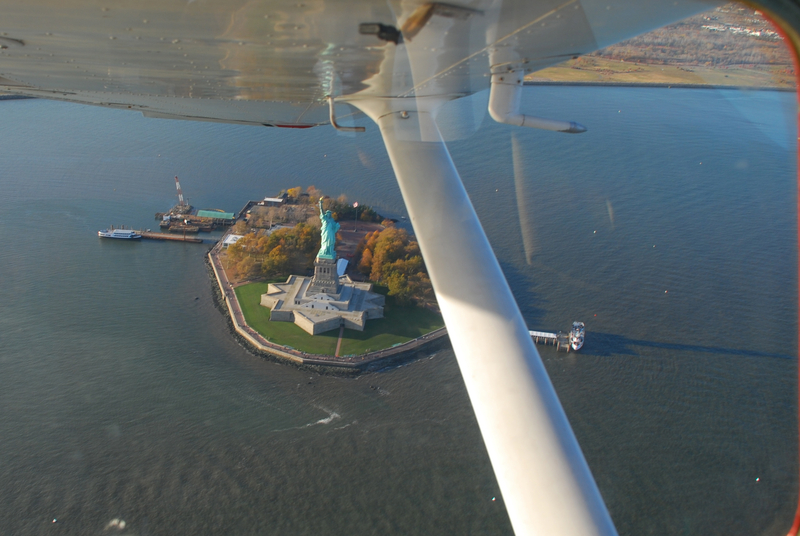 You get to fly around 1000ft around the island of New York. It’s pretty epic. There is a section of the NY Bravo by the shore that drops down to 500ft, so he taught me how to do a DME arc and we went further out to sea to avoid flying at 400ft. I pretty much rocked it, I told him I’d ace instrument training if it was all like that. The reason the Bravo jumps down that low there is it is the final for JFK. On the GPS it was pretty cool to see tons of planes all coming in. A little scary having a 747 about 1000ft above and descending. At the end of the arc we head straight for Coney Island. It’s the only part that Jake hasn’t done before. It’s fun seeing all the rides. I’ll get a better view on the way back. 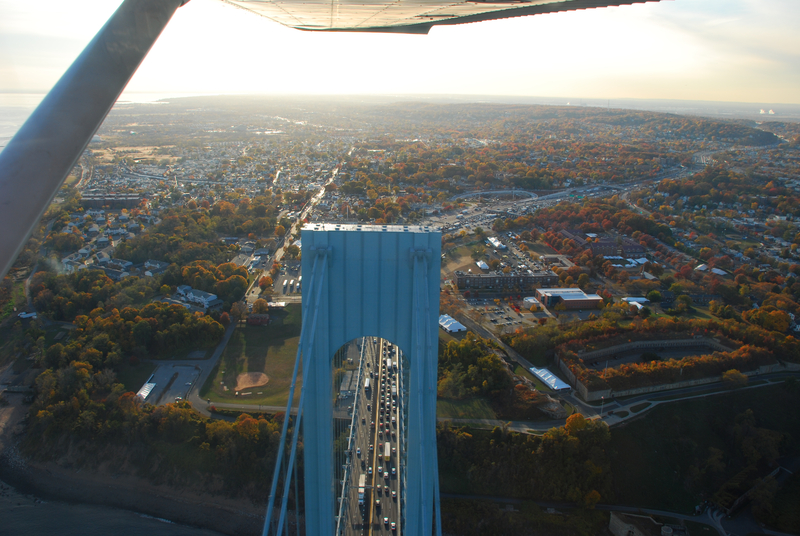 We go to the Verrazano Bridge now. I’m getting a bit nervous because we’re at 900ft. The bridge is 700ft tall. We have to stay to the right on the bridge where the tallest part is, but you obviously don’t go over it just a bit to the left. A thrilling experience to go over something that high, but that close. And it’s completely legal! 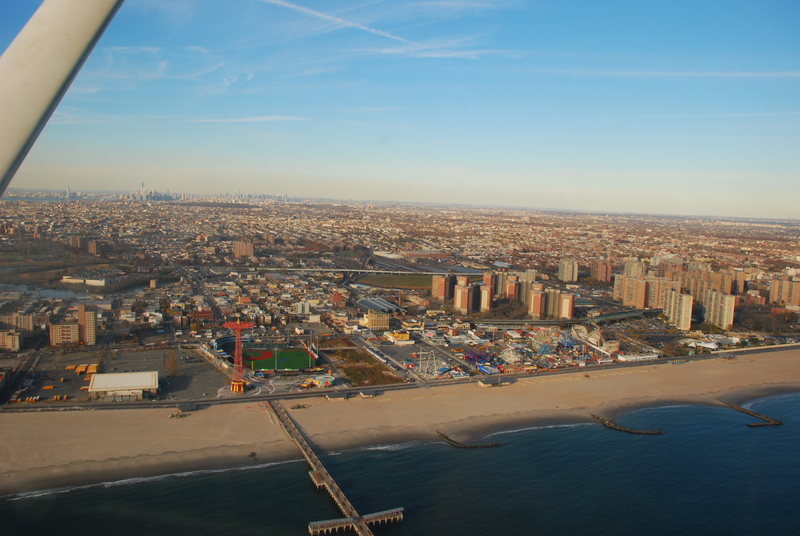 Next up, we were trying to do the East River Exclusion, which the rules changed and you need to talk to LGA Tower and get clearance up into the Bravo airspace. The controller was super busy so she wasn’t responding. 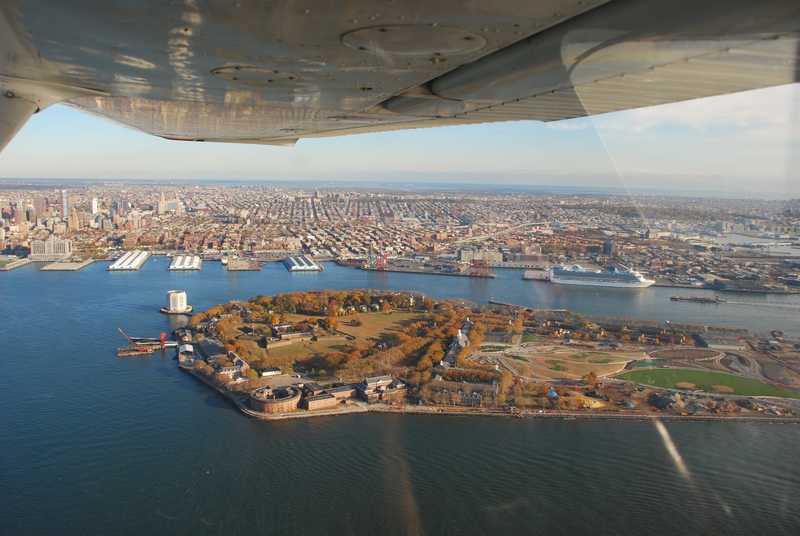 We avoid going to the right of Governor’s Island and head up the Hudson. You self announce on the Hudson River Exclusion. Jake was in charge of the radios during this part, so he did all the announcing. A helicopter passed about 200ft under us as we entered the Hudson! Heading northbound on the Hudson, you stay near the east bank (always to the right). Lots of helicopters going southbound and passing us around our level. If you’re not maneuvering you stay at 1000ft but if you are you drop down to 900ft or below, that’s also where the helicopters are. Jake was getting the view of NYC better than I was at this point. We pasted the George Washington Bridge and went a few miles past it, dropped down to 900ft and did a 180 degree steep turn to go back down the other way. Whooo uses of flight training maneuvers! Now, I got the pretty views! 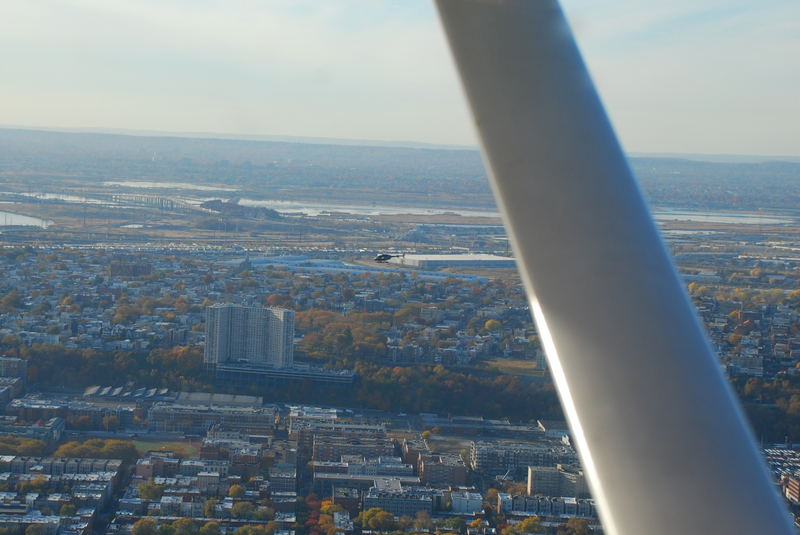 We also had a King Air pass above us going to Teterboro. After we had passed the GW Bridge again, Jake turned and told me “This is where Sully was,” of course, I knew exactly what he was talking about and avgeek’d out. If you don’t, he’s the captain that landed US Airways Flight 1549 successfully in the Hudson. We passed the Freedom Tower, which is 1,792ft tall! It was much taller than we were flying and so I had to look up to see the top of it. Here’s the fun part. I got to circle the Statue of Liberty! Best point ever to turn around. This time we weren’t worried about making a perfect circle, it was avoiding the airspace at the back of the statue. We had a VOR tuned in that if it was aligned I was in the other airspace. I did two turns around her, and Jake had to talk to another helicopter while doing it because he was waiting to circle her too. We tried one more time to go up the East River, it wasn’t happening so headed back across the Verazzano Bridge and past Coney Island and I had to do the DME arc again. Along the coast of Long Island, Jake wanted to do a zero gravity maneuver, where you climb and push over hard and become weightless. I was nervous about it, but we did it a few times. He made me do it as well. One time, I had a pen in my hand and he got it to float. Sadly, the GoPro was on the wrong setting and it was all dark. I grab the ATIS and get ready to land back at FRG. We request touch and go’s so Jake can land a few times, but I called first landing. It was a greaser landing! One of my best. Jake applauded me on the upwind. He was super impressed. Later on in the night he said the downside is I can only get worse from that. I told him no, I could get better by making every landing like that. Another 152 entered the downwind from the north as we turned crosswind. We had no idea what this girl was doing, her patterns were huge and her altitude was all over the place. Jake thought he was going to crash she was so low on her final (okay, but he thought I was too low on landing because he’s used to being up much higher when crossing the threshold) His first landing is….not great. He’s right of the center line (oh yeah, I was dead on that line) and he flared too high because he’s used to the ERJ. I’ve wanted this picture ever since I started dating a pilot, but guess who’s PIC! The only downside is we had to run part of the way to catch the train on the way back. 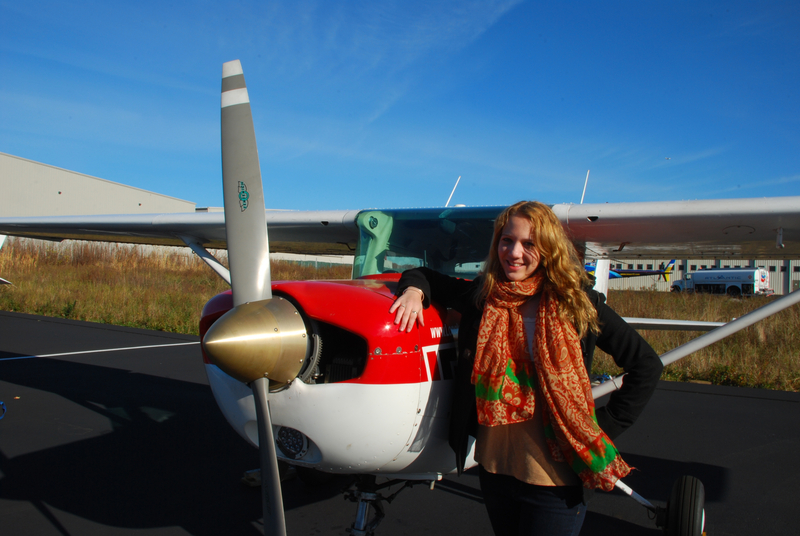 But overall, it was fun and I’m glad this was my first adventure as a Private Pilot! Alright, being fair and honest for those thinking about training. Here is my Private Pilot broken down all in numbers. I’m sure a lot of people don’t like to admit on how much they spent on training, but I would have loved to know more about these added costs when budgeting my training better. It’s also just all my numbers throughout training. It was kind of fun going back and realizing the numbers of instructors I’ve had (for progress checks as well!) and airports where I’ve landed. So there you have it, that’s what I spent to make this dream come true. I think it was worth it, I’m not sure what else I would have done with that money. I don’t regret anything. So onto the flying portion of my check ride. My DPE needed another smoke on the way over. He watched me pre-flight from afar. I made sure it was super thorough. I pulled the plane forward to check for bald spots on the tires, which isn’t something I always do. After I finished it was time to fly! He kept switching between calling me captain and Wilbur (he was Orville) which was kind of fun. We climbed into the 152. I actually had trouble starting it. It was the first flight of the day and it’s getting colder. I primed it twice, pumped the throttle, it wasn’t starting. I turn the Master off and think. Is it because it’s cold or did I flood the engine? I remember flooding the engine on a solo cross country and remember how I have to restart it: throttle all the way in, mixture all the way lean, start it and quickly switch their positions. I’m not sure (not that experienced yet!) I try another prime first just in case. It starts! Yay! I get the ATIS, talk to ground and remember to request a left downwind departure. He hates Republic airport, thinks it is the worst tower. My first take off is a soft field take off with climbing over an obstacle. Tower says line up and wait. I’m holding the yoke back and waiting. Waiting. The traffic has already taken off again. Why are we waiting? He’s frustrated with the tower. Finally cleared to take off. Soft field pretty good. When I took the flaps out he just suggested I accelerate to 60 knots before so I don’t sink. He said I hit the second giraffe (he flew in Africa and said sometimes there would be giraffes at the end of the runway i.e. dirt road). The ceiling was lower than forecasted or said in the ATIS. I thought he would discontinue it. He asked what it meant with a southern wind and these low clouds meant. I wasn’t sure, he said that fog and clouds could come in quickly and it is possible to become IMC fast. He still had us go, but asked if I would have still gone to the cross country location alone. I said no, he approved of that decision. We went to the north practice area. Started tracking the Carmel VOR, it wasn’t picking up that well since we weren’t high enough. He had me switch to the Calverton VOR, I tracked that fine. Whooo! Then moved onto instrument work. Did turns, climbs, descents. Took that off within 0.2. By this point we were at the east end of the south practice area. He has me head towards the shore while he calls up ATC. He had me do a 360 to avoid going into the Charlie. I head east and he wants steep turns. He said I already cleared the area. He wants both sides, doesn’t care what I do first. I do my left side first since I know its my weaker side. Done. Right. Done. They were within standards. I’m doing something I didn’t do on my pre-solo progress check. I’m taking this ride one thing at a time. Not thinking forward to other moves. Not focusing on pass moves. I know I passed them if he didn’t say I failed. So there’s no need to focus on them. Next is slow flight. He said I already did two 360 turns so no need to clear the area. I get the stall horn sounding. He had me do a 180 turn. I roll out more than 10 degrees past my heading. He seems fine with it and takes the controls and does a crazy side to side with the yoke to show me how mushy the plane is. He says just make the plane do what I want it to do. I already did a 180 turn so go straight into a power off stall. I do it, and it’s good. I maybe push the nose too far forward, but it was fine. Turn to the east (was facing west) and did a power on stall. My wing drops to the right. I knew it was coming, I could feel the plane being uncoordinated. Fixed it like a boss. He said my engine was on fire and do an emergency descent. After I get down a bit, he says the fire is out but the engine quit. Emergency landing. I pick a parking lot (he prefers the beach – another DPE won’t let you pick the beach so I was used to parking lots. In a real emergency, I’d pick the beach) I get down to 500 feet and execute a go around. We get the ATIS at KISP for wind direction. He picks a water tower and I do turns around a point. I rock them, they are the best turns around a point I’ve ever done. I do lose a bit more altitude than I’m supposed to but he lets me fix it and the second time around it’s steady. We divert to KISP. We were supposed to go to KBDR, but the weather is too bad. I had never been to KISP. It’s also a Charlie Airspace airport. Exciting! I’m cleared for a straight in. He insists on talking to tower so they know it’s him in the airplane. He said he purposely did it so I have straight in since it’s harder. I’m used to weird patterns at KFRG so it’s a non issue. I’m a bit high, so I did a slip to land. Rock it! I’m normally a bit uncomfortable with them, but not today. Regular landing first. Winds are straight down the runway. Great landing! Next one, short field with an obstacle at the front of the runway. I have to be at 160 feet at the chevrons and have to stop before the taxiway. I’m a bit high, he changes it to soft field. I slip again for funsies. I’m at 160 ft at the chevrons, he says do short field. I do it. Yay! We take off and go back to KFRG. One more landing to do. I get a left base for runway 19. Then have to change into the downwind because of a North American plane on a straight in. I turn back, the controller also has a Piper turn base not too far behind me while I’m also on base. He’s pretty close, the DPE said let the controller worry about it. Soft field landing. I’m weaker on these. He’s also based out of Bayport which is a grass field so does them all the time. Probably one of my best soft field landings with a crosswind. I’m a bit right of the center line, but it was straight and soft. The controller asks if I can get off at Delta, I tell him I can’t. He has me get off at runway 14, which was a bit of a stretch. The DPE helped me. I didn’t think I was going dangerously fast. He says never let me be pressured to do something dangerous by controllers, if the other guy has to go around, no big deal. I taxi back. Call for fuel. Stop the plane. 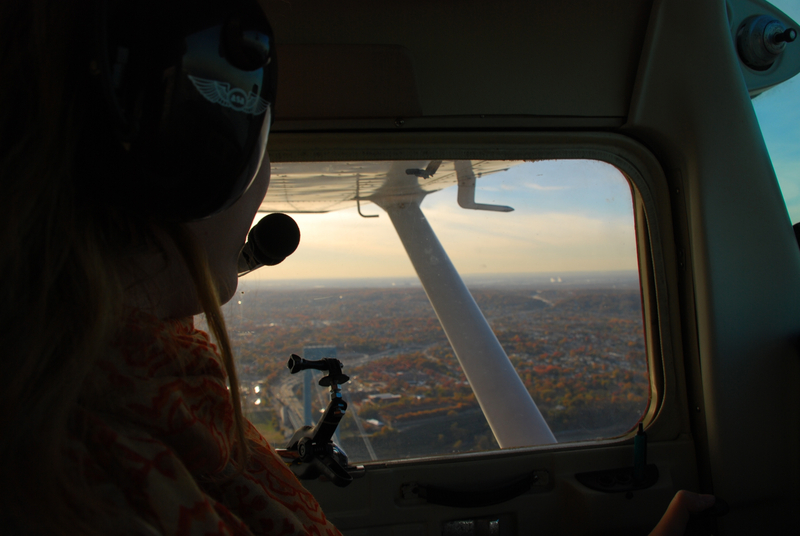 He says he has one more question for me: how does it feel to be a private pilot? Yay!!!! Big smile on my face! We’re getting out to push the plane back. I’m waiting for him to get ready, the fuel truck pulls up, my CFI pulls up. In the car, he gives me the thumbs up and a questioning look. I give up a thumbs up and a smile back. He smiles and parks next to the plane. I look over at the fuel truck and it’s Winston. He gives me a shrug and questioning look. I give him the thumbs up as well. He gives me a double thumbs up and a celebration seat dance. I laugh and am so happy! My CFI comes over and gives me a hug and we push the plane back. When Winston comes over he gives me a hug as well. I’m so excited! I did it after all this work and frustrations! We go back to the office and I get my temporary certificate. My DPE graduated from art school and did amazing calligraphy in my logbook. Now, I have a super special logbook that is pink and has calligraphy in it! I can’t wait to take my first person flying. Hopefully, Jake and I will go next week!